Heysel Stadium - shortly before the tragedy occurred. Flickr/youtubers watch. Some rights reserved. The following foreword is taken from the book Heysel, the Truth by Francesco Caremani. We are publishing it here in honour of the thirtieth anniversary of this great tragedy. There is no other book about the events at the Heysel stadium on 29 May 1985 more relevant than this one. Even the title -Heysel, the truth - about a tragedy foretold suggests that in terms of prevention we are never ahead. What happened was avoidable. It could have been avoided. It should have been avoided. And already 30 years have passed. Francesco Caremani chose to return to this tragedy delivered from the belly of Juventus-Liverpool on 29 May 1985. A great and noble idea. He asked me what I wanted to write in my foreword, if I wanted to edit it for the updated edition of this book. I decided to leave it exactly as it was. Not because I was lazy, but simply because I don’t regard it as being “out of date”. I adjusted a few things, edited a few details. The book was published in 2003. On 2 February 2010 we remembered, silently, the third anniversary of the killing of Filippo Raciti, a police officer who died at the Soccer Stadium in Catania while the local team was playing against the Palermo football club. The violence was worthy of an arena, with soccer providing the platform, and sometimes the aim. Italy is the country of slogans (“Zero tolerance”), of turnstiles, of supporters’ ID cards, and supporters with cards. And it’s we, Italians, when we refer to Mario Balotelli, who claim that blacks cannot be Italian, we are the ones who profess that “Opti Poba has come to Italy otherwise he would be still eating bananas” (statement of the new elected head of the Italian Football federation Carlo Tavecchio). It is because of us that Ciro Esposito died in agony after an atrocious shooting. We are those, we are always those. I quoted facts and statements pertaining what happened after the Heysel and following the first edition of this book, The Truth. Everything passes, yet everything stays the same. Aside from the updates, edited by the author, remains the drama of a slaughter that has taught us very little, as we are still attached to the seventeenth-century English thinker Thomas Hobbes’ idea of the homo homini lupus. We dare not lower the guard. “The Italian stadiums are in the hands of the Ultrà”, ring the words and music by Fabio Capello. He stated and repeated that after, not before the disaster. Into the hands of the Ultrà and, I would suggest, of the Ultrà journalists and of the TV shows, that are often more fanatical than the new barbarians. Heysel remains an immense wound that jolts our memories, and has scarred our conscience, not only in Italy, but among all those who are perfectly aware that they were involved in something untoward. By returning to this space and time, we hope to spurn the indecent temptation of allowing bygones to be bygones. Thirty years and thirty-nine deaths later. I am obliged to admit to being a Juventino. I got married to Liliana to the strains of You’ll never walk alone, the anthem of the Liverpool football club, the English club closest to my heart. 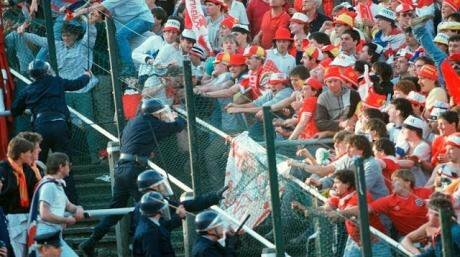 The truth is that it was like that before the Heysel and it still is so. I was there too, that day. At that time, I was working for the daily La Gazzetta dello Sport, and I had contributed to a celebrative special insert to be published only if Juventus were to win. For obvious reasons the special edition was stillborn. I remember that it was a hot day, and suddenly, in one section of the stadium to my left, there was a hell unfolding. The price of that hell was the death of thirty-nine people, and they are the reason for a book, for this book. An uncomfortable read, I hasten to add. And a one-sided one. But on the side of good and of right. Francesco Caremani dug through tears, autopsies and post-mortems, showing how and why we had to add another layer of pain and indignation to the hurt and outrage already perpetrated in the carnage. All of this within a lethargic bureaucracy surrounded by disengaged sports institutions wriggling irresponsibly from the tragedy. That was 29 May 1985. The Heysel has been razed to the ground since, rebuilt and renamed King Baudouin, and no trace has remained of the notorious block Z, the fatal and lethal trap. Nonetheless, the Heysel and its gulag will live forever. On that evening, merely an ounce of organizational efficiency would have helped to avoid the massacre. The Belgian authorities and the UEFA lacked emergency measures and the fury of the hooligans did the rest. The heartbreaking irony is that the Brussels disaster was more useful for the English than it was for us, more to the advantage of the aggressors than those targeted, of more benefit to the perpetrators than the victims. Every time an accident occurs, there is a lot of talk about the “English model” and its laws: harsh, strict, prompt. On the contrary we, the Italians, have understood very little. And here we are, consuming our own stomachs while we wait for a decree, and then an amendment, a decree, and then an amendment, always at the receiving end of a system. Otello Lorentini is the actual narrator in this story, not me. Otello lost his son Roberto at the Heysel, and may be regarded as a sort of Virgil who accompanied the author in the underworld both during and after the tragedy. Lorentini was head and founder of the former Associazione fra le famiglie delle vittime di Bruxelles (Association for the families of Brussels victims). He transformed his pain into incredible, positive healing strength. He challenged everyone, and knocked at every door to prevent these unfortunate people from having to “die a second time”. It was not easy and it took time. In the end though, he gained something. His relentless dismantling of the facts was met with embarrassment, defensiveness, and reticence. If I had been Giampiero Boniperti, I would have hidden that bloody cup away and returned it to the tournament managers. That match was played in order to prevent further mayhem, fights and even more losses. It was won by a non-existent penalty, which was considered an acceptable outcome in this macabre chaos on a world stage. It is as impossible to forget the exultations, as it is impossible not to stigmatize them; of course, it is easy too to point fingers. Nevertheless the awkwardness of this protocol had an appeasing purpose (“when the acrobat falls, the clowns enter the ring”). In terms of the soccer almanacs Michel Platini’s career ended on the day of his retirement, on 17 May 1987. But in reality it ended that night, under those eleven meters and that sense of guilt. Memory is something which needs to be trained, exercised. These pages serve the function of a gym where these horrific memories are being relived and we recall this appalling behaviour – something Italians prefer to sidestep in their lethargy. Apart from the compensation, and other measures taken (whether it is much or little) we don’t have to surrender to the ennui. The Heysel disaster is something that lies heavily on all of us. And we will never be able to downplay it; it would not be right. Thirty nine people died because of a soccer match; because of poor ticket allocation, drunkenness, lack of public order. Sooner or later, destiny’s bell tolls for all of us, but when it tolls deafeningly inside a stadium, there is no other option but to rebel. The alternative is to document it, as Francesco has done. Without rancour, with no fear or ulterior motives, he has called a spade a spade. What happened at the Heysel was a tragedy. The hope is always that the blood and cries will help to prevent such catastrophes in the future. There is a proverb in Italian which reads: “Time is a gentleman”; if we want Time to be a gentleman, we need men and institutions to act in the same way. I invite you to read these pages: you won’t discover any new horrors. But you will learn how hard it was to light a candle of justice. Only a candle…not a chandelier.